The prime directive of our research program is to untangle the fundamental chemical dynamics and hitherto elusive reaction mechanisms involved in the formation of complex molecules in extreme environments covering 10 K to a few 1,000 K.
The prime directive of our research program is to untangle the fundamental chemical dynamics and hitherto elusive reaction mechanisms involved in the formation of complex molecules in extreme environments covering 10 K to a few 1,000 K. For the high temperature end, these comprise, for instance, combustion flames, propulsion systems, and circumstellar envelopes of carbon-rich stars, whereas cold molecular clouds, star forming regions, and distinct Solar System environments (hydrocarbon rich atmospheres of planets and their moons, comets, Kuiper Belt Objects, Mars, Moon) relate to low temperature down to 10 K.
Polycyclic aromatic hydrocarbons (PAHs) - organic molecules com­pri­sing of fused benzene rings – have been at the center of attention as prospective candidates initiating the formation and growth of complex organics and carbonaceous nanostructures in circumstellar environments of carbon rich stars. However, the validity of these mass gro­wth processes beyond the simplest PAH - naphthalene (C10H8) - has remained conjectural, since a very limited number of laboratory experi­ments have been conducted to corroborate to what extent complex PAHs like anthracene (C14H10), phenan­threne (C14H10), and pyrene (C16H10) can be synthesized. 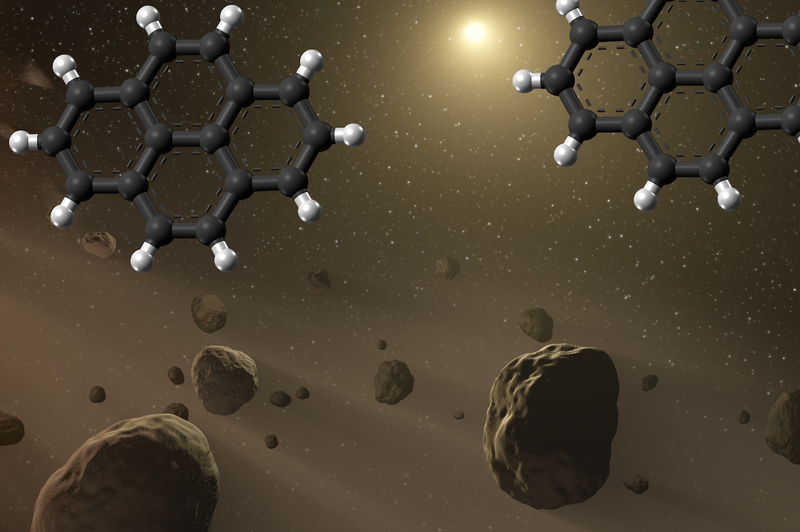 Our study provided for the first time actual evidence how PAHs as complex as pyrene can be formed in circumstellar envelopes. In the past, astrochemists often speculated on formation routes to PAHs and carbonaceous nanostructures, but the present investigation demonstrated that experiments combined with electronic structure calculations have advanced to such a level that molecular mass growth processes can be unraveled in the laboratory one step at a time. These data are critically required by modelers to predict where in space PAHs and related compounds can be formed be processed chemically. This in turn also helps to understand to what level these molecules can be eventually be incorporated into the building material for Solar Systems including our own so that on Earth, these extraterrestrial PAHs can be eventually be detected in meteorites such as in Murchison. In the future, we plan to expand these studied to more complex system even up to coronene and beyond with the ultimate goal to decipher the routes to fullerenes in deep space.